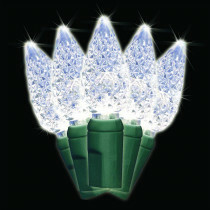 White C6 LED bulbs bring a classic, old-fashioned ambiance to your holiday decor. LED lights save energy are cool to the touch, making them safe around children and pets. Each strand has 35 bulbs and measures 12 ft., including a 4 in. lead cord, 4 in. spacing between bulbs and 4 in. end cord. Includes spare bulbs and fuses. Strung on green wire to blend in with Christmas tree and exterior landscaping. Set of two, 35-light strings for 70 total bulbs. Suitable for indoor and outdoor use. UL-listed. Box of 2.